The MBTA is pleased to announce the brand new Silver Line 3-Chelsea route will operate between South Station and the Chelsea and East Boston communities beginning Saturday, April 21, 2018. "Silver Line 3-Chelsea relates well to the Baker-Polito Administration's economic development goals," said Transportation Secretary and CEO Stephanie Pollack. "Silver Line 3-Chelsea is consistent with the notion that if the MBTA can offer an efficient, fully accessible, one-seat ride between key destinations then more people will use mass transit and the service will spur transit-oriented development." "The MBTA is excited to bring this new service to Chelsea, East Boston, and the surrounding communities," said MBTA General Manager Luis Manuel Ramírez. "We believe the SL3-Chelsea will simplify the commutes of many of our customers in these neighborhoods." "We are continuing to make major investments to our transportation system statewide and are proud of this new service that will soon be available for residents throughout Boston and Chelsea," said MassDOT Highway Administrator Jonathan Gulliver. "We appreciate the hard work of everyone who has played a role in this project, including the MassDOT crews and contractors that managed construction operations, and look forward to members of the public being better connected to jobs, businesses, neighborhoods, and opportunities throughout this area." "Silver Line 3-Chelsea is a great addition to the public transportation options in Chelsea," said Representative Daniel Ryan. "And the timing couldn't be better. With Chelsea and the surrounding areas facing a lot of infrastructure work in the next few years, SL3-Chelsea will help alleviate some of the congestion and concerns. I thank the leadership of the MBTA for seeing this project through. Most importantly, I thank the people, and leadership, in Chelsea for their patience and advocacy during these infrastructure improvements." "The Silver Line 3-Chelsea route is an exciting and important addition to public transit infrastructure in Greater Boston," said Representative Adrian Madaro. "This project directly connects East Boston and Chelsea to the Seaport, providing a long-awaited connection that will allow local residents better access to one of the largest job growth sectors in the region. Moreover, this new route will help reduce congestion on our roads through its improved connection of the Silver and Blue Lines, easing travel for those going to and from Logan International Airport." "I am excited to learn that the MBTA will be beginning Silver Line service in the City of Chelsea," said Representative RoseLee Vincent. "This new and expanded public transportation route will help to reduce overcrowding on MBTA buses that serve Chelsea, as well as provide residents of Chelsea an alternative and more direct route to subway routes and downtown Boston." "Silver Line 3-Chelsea service will be greatly beneficial to Chelsea commuters and add a much needed link to downtown Boston and the Chelsea and East Boston neighborhoods," said Senator Sal DiDomenico. "This is a welcome addition to the transit options offered to Chelsea residents, and I would like to thank the MBTA for their work and partnership with the Chelsea community to make this a reality." 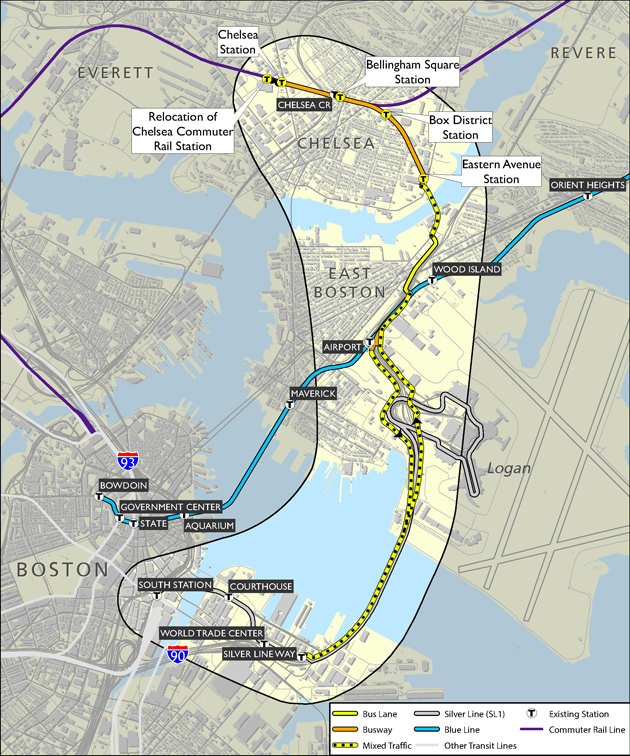 "Silver Line expansion will provide the East Boston community and the entire region with vital access to alternative transportation methods," said Senator Joseph Boncore. "A direct connection to South Station will not only provide for expanded economic opportunity by linking these neighborhoods, but will also serve to reduce congestion in East Boston." Bus customers from Revere and Chelsea who tend to experience crowding issues on Bus Routes 111, 112, 114, 116, and 117 will benefit from the SL3-Chelsea. As an additional travel option, the SL3-Chelsea will make enhanced, new, or simplified connections to the Blue Line (at Airport Station) as well as the South Boston Waterfront and the Red Line (at South Station). Nearly 7,000 daily bus customers on these area routes take trips that can require several transfers in order to travel from Chelsea and East Boston to downtown areas. This commute is now simple and direct by using the SL3-Chelsea, filling a critical gap in access between these residents to the employment opportunities in the Seaport District and downtown. The SL3-Chelsea route will operate 60-foot, high-capacity buses serving four new stations through dedicated, bus-only lanes in Chelsea and via the Coughlin Bypass in East Boston. Customers can board the SL3-Chelsea using a subway one-way fare or subway monthly pass. SL3-Chelsea buses will operate approximately every 10 minutes with the time between Chelsea and South Stations anticipated to be between 20 – 30 minutes. This new service is the first brand new service to be introduced to the MBTA system since the MBTA Greenbush Commuter Rail Line began in 2007. Construction of the SL3-Chelsea route began in March 2015 with construction of dedicated busways and four new stations. Construction of this $56.7 million investment was managed by MassDOT's Highway Division and jointly funded by the MBTA (approximately $49.1 million) and MassDOT ($7.6 million). Both meetings will provide Spanish language interpreters. Both locations are accessible to people with disabilities with reasonable accommodations and/or language assistance provided upon request. For accommodations or language assistance, please contact Katy Zazzera by phone at 857-368-8986 or by email at kathryn.zazzera@dot.state.ma.us.